The HP sauce model. I have always liked the UV-82 it has a clear well built feel, improvements are always welcome, but I just bought 2 pack of the old model for a touch more than £40 great VFM..
Are you able to lock out frequency mode on this set and where did you get the twin pack for that price? The menu mode can be locked on the UV82-HP to prevent field programming, as you can with the UV82C. Hi Hans, so the technical review is the same as from the 82P? Or are there improvements to? The US Amazon doesn’t ship to Europe. Any idea where to buy within the EU? 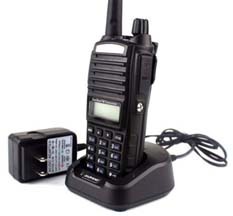 I search too for EU (I’m in France 🙂 ) now only Baofeng Tech.com can expect this radio in EU, I sent information and I have this answer : can ship to France for $17 via First Class Mail. Anyone have an idea which, between the GT-3 Mark II Triple Power and the UV-82HP, is better? Noticed that this has a full watt more of transmit power than the GT-3TP, but how’s the quality with the new chipset? UV-82 is the better choice. i dont have a HP yet, but the original is far better than the GT-3. best of all – dual-PTT. that’s not a toy, once you get used to being able to work 2 channels without constantly messing wih the A/B button you never want a single PTT radio again! Ordered! Figured we needed a second radio for the house. The price point is too good to pass up and with the experiences I’ve had with the GT-3TP, I can’t see a reason not to purchase another Baofeng/Pofung radio. The GT-3 has a smaller than usual access hole at the base of the antenna, so not all replacement antennas are fully compatible. I too have noticed the smaller antenna hole and as a result only one of my SMA to BNC adapters actually fit (with a nasty gap) and the other does not. I haven’t experienced the programming cable and/or the speaker mic not fitting properly with my unit. I am using the triple power version of the GT-3 — Perhaps a design change? The speaker mic fits perfectly snug and doesn’t slip out or cause the radio to key up randomly. I’ve only used the programming cable twice and haven’t experienced this issue either. The speaker/mic is Pofung’s that came with the radio and the cable was included in the bundle too (not sure of brand, but worked with Prolific drivers, no problems). I’m a bit confused with the link you posted of the comparison — I thought the GT-3TP had different hardware than the UV5R? Same with the UV82 and UV82HP? The physical differences are the same. The UV5R and GT3 share the same size, battery, etc., as do the uv82 and uv82HP. My personal preference is the 82HP. The GT-5 and UV-82 and UV-82HT have good idea of dual PTT, it’s better when we have multiple team (in evenmential is perfect). If you search better price, I found 2x GT-3 TP mk3 for 110€, 2x GT-5 for 80€, 2x UV-82 for 64€, and UV-82HT I don’t found the best price (expensive now… we need wait again for found less price). When are you expecting to get one to do a proper test? It’s too bad that there isn’t a larger battery available. At 8 Watts that battery will drain quickly. Did you kill Hans so you could take over his blog? Is that why he hasn’t been around lately? Actually, I haven’t heard from him in about a month. I know last year he disappeared for a couple months to take care of some family business. I just spoke with Hans a short while ago. He is fine and doing well. The reason for his absence has to do with family health issues. Right, that will be his wife then. Well, thanks for letting us know, we can back off on the questions and speculation now. Can someone help me? I am using tis radio and i love it but sometimes i got this warning “Transmit over time” even if i am not transmitting (as i know). Is it could be some interference or the PTT button got pushed in the radio pouch? I an confused because nobody said that i am transmitting. And they could use the channel. That was going to be my guess. If the pouch is too tight, it could press the PTT. I’ve had that happen when I sit and squeeze the radio against a chair. Hi there, newbie here and very radio naiive. I have a Baofeng UV 82 which has a constant pulsing sound, occurring about 30 times a minute. The radio can be on for a few minutes and remain quiet but then starts the annoying pulse once it transmits or receives. FWIW, the “SAVE” is in “off” and “ABR” is on “5”. Any help? I’d also be curious if anyone else has experienced that occurring. I’m drawing a blank from this end.